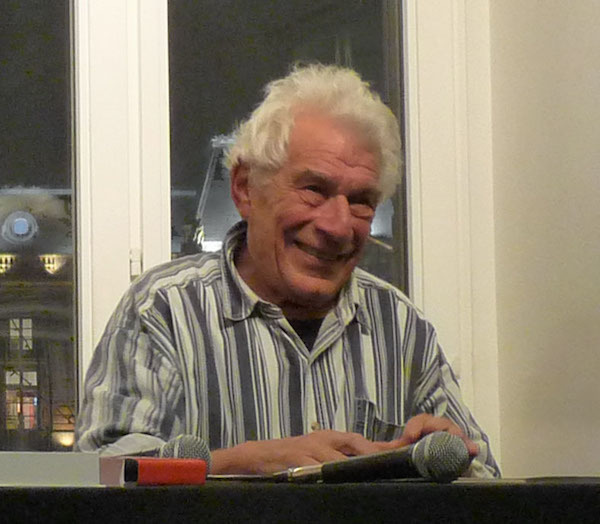 John Berger, 2009. Photo: Wikimedia commons user Ji-Elle. This would indicate that everything Berger wrote was part of a political project, everything a representation of a political theory, Marxism: In a late interview, he said that his readings of Marx in his teens “helped [him] enormously to understand history and therefore to understand where we are in history and therefore to understand what we have to envisage as a future thinking about human dignity and justice.” But like Walter Benjamin—the writer he most resembles in his themes and ability to use language in a magical manner that differs from our expectations of what political language should be—Berger’s appreciation of certain kinds of experience may have been suspect to some more dogmatic and programmatic Marxists. Voices, 1982—, still from a TV show on Channel 4. “To Tell a Story” episode. 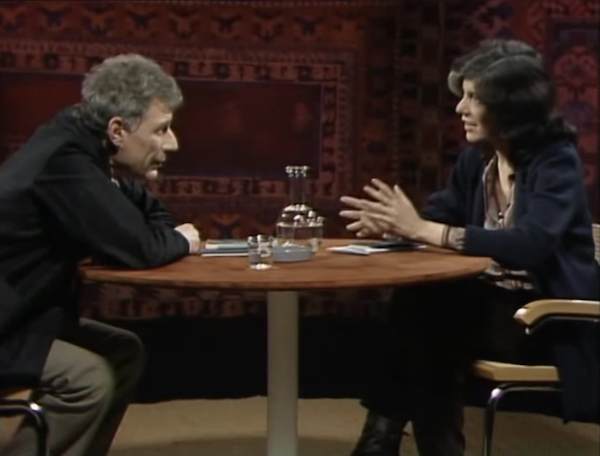 John Berger and Susan Sontag. In a sense, Ways of Seeing, Berger’s 1972 television series, enacts the revolutionary premise and promise of Benjamin’s “The Work of Art in the Age of Its Technological Reproducibility” and develops from his critique of aura. Ways of Seeing was aimed at a popular TV audience. It respected that audience but did not condescend to it. His views about representation of women, reproduction, the role of art in capitalism are all still valid. In fact, especially when it comes to representation of women or anything that represents a feminist critique, the TV show (and the book developed from it) remain remarkably current. Because of the accessibility of its language, it is incredibly useful as a primary teaching tool, though Berger himself anticipates, in the script, technological communication developments that would need to be used and addressed if something like the project were to be attempted now. The TV show, perhaps even more than the book, successfully embodies and develops the political role of montage and collage in opening up the viewer’s initial assumptions to new ways of seeing what they had thought they knew—exactly as the title of the show indicates. The mixed methods of presentation that constantly call attention to the physical and sociological placement of the viewer, to his own methods and context, are exemplary of a dialectical methodology emerging from Benjamin and the Frankfurt School, but with an ability to communicate that is not intimidating. “Every artist’s work changes when he dies,” Berger wrote shortly after Alberto Giacometti’s death. For me, Berger was a model of what I’ve sometimes called “sort of an art historian,” someone who is not constrained by the politesse of a specific professional methodology and thus is more inventive in the connections he makes and the interjections of poetically worded thoughts that, because they seem unexpected and almost out of place, make the text flexible, resonant, and inspiring. My favorite book is The Sense of Sight, which I read when it was published in the early ’90s. It contains essays that seem so personal that you wonder what they are doing there, if, as I did, you have brought certain expectations of “objectivity” or academic impersonality to essays about art. Brecht, in his diary about his friend Walter Benjamin, wrote, “It is all mysticism, mysticism in a posture opposed to mysticism,” and there are those who I’m sure scoff at Berger’s lack of Marxist rigor—or is it really at his lyricism and his love of painting? But nothing ever seems self-indulgent about these texts; each component of the book seems precisely chosen for its relevance to his underlying themes, with a strong emphasis on historical context. But the didactic or polemic or ideological is nestled in something intimate and elegiac. Certainly, Berger’s moment was the postwar period from the ’50s to early ’90s, with some of the most important critical and fictional work done from the late ’60s and ’70s, at the same time as contemporaries such as Guy Debord, as well as such politically engaged writers as Lucy Lippard—another “sort of an art historian” who wrote in various registers as inspired by the character of the artwork, and who could, like Berger, encompass the political and the aesthetic without the layer of recondite theoretical language or dense jargon that came to characterize ’80s art criticism. For me, his words came out of nowhere. Incredibly, for someone who was involved in the beginning of the feminist art movement, I had not seen Ways of Seeing on broadcast television in the ’70s. When I finally watched the show on YouTube a few years ago, I was vastly amused and somewhat taken aback by the appearance of the cute guy in a tight-fitting Carnaby Street–style print shirt with the kind of upper-class British lisp—“we wealize,” “the pwice” [for “the price”], “Euwopean”—that Monty Python would have a field day with. In a way, I was retrospectively happy that, when I first encountered his writings, I had not been burdened by the specifics of the man as a man and could take in his ideas and his words in an act of what felt like private discovery, mind to mind. Berger often somewhat disingenuously said that he was not good with words. But I’m happy that for a long time I had only the words. I could work from them, without regard for the man. Unlike Benjamin, whom Hannah Arendt described as having fatally “bad luck,” Berger lived a long, productive, and successful life as a writer and, from what one can tell, as a person, remaining sharp of mind until the end. We may mourn him as a symbol of a system of values and thought that we now see as having ended. But writing, like art, continues to live long after the artist or writer has died. Berger could write about a Frans Hals painting as if it had been painted yesterday and he was in the artist’s studio. For us, there are the texts, and so much on film and video. We can continue to meet him at various stages of his life and be assured that there will be various John Bergers for us to reference at different stages and different historical moments of our own lives. A few comments and words were adapted from Mira Schor, “The Berger Mystery,” August 8, 2011, on A Year of Positive Thinking. Mira Schor, a painter and writer living in New York City, is the author of A Decade of Negative Thinking: Essays on Art, Politics, and Daily Life (2009) and of the blog A Year of Positive Thinking. She is represented by Lyles & King Gallery in New York and CB1 Gallery in LA. For additional John Berger Passages, see the forthcoming March issue of Artforum.